Waterproof bins resist rust and corrosion. Quantum's exclusive Stackable Shelf Bins are an industry first and are ideal for medium size and large or heavy item storage. 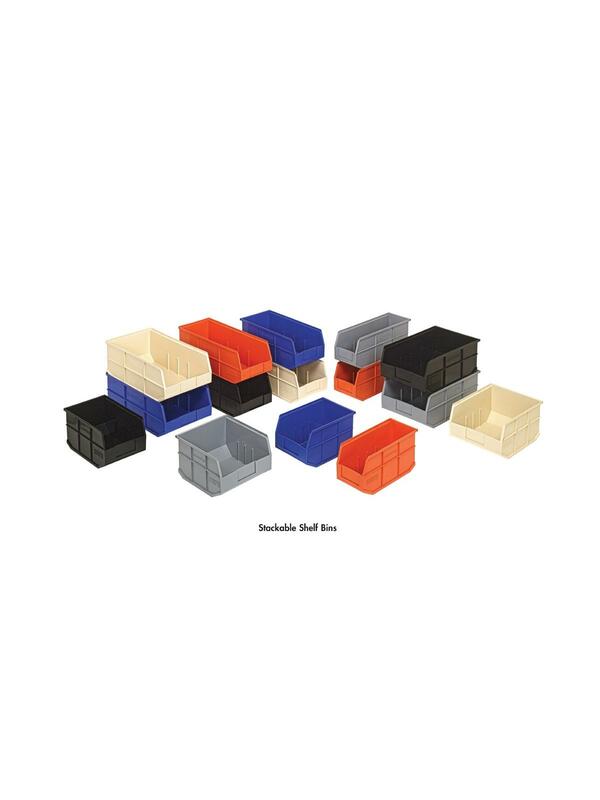 These strong, durable polypropylene bins are available in 4 lengths and 3 widths. 12", 14" and 18" deep bins have a built in rear hanger which allows bin to hang from louvered panels and rails. Bins have a raised front opening when compared to any like product allowing you to truly maximize the complete bin's storage capacity. Optional cross dividers allow flexibility and keep parts organized. Large molded in front label slots for ID labels. Autoclavable up to 250°F and resistant to extreme cold. Available in Black, Blue, Gray, Ivory and Orange. FOB Shipping Point. 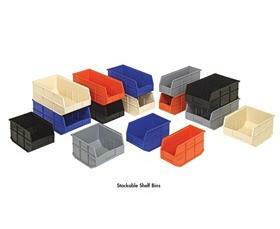 See Related Items tab for Dividers for Stackable Shelf Bins and Wire Shelving Systems with Stackable Shelf Bins. 14 x 8-1/4 x 7"14 8-1/4 7"
13-1/2 x 7-3/8 x 6-1/2"13-1/2 7-3/8 6-1/2"